First off, I hate football. Second, I hate the hype surrounding this upcoming game. That being said, I cannot and will not root for a team from New York. Go Pats! The Flyers slogged their way to an ugly win against the worst team in the league last night in beating the Kings in overtime. Mike Richards threw the puck at the net and Scott Hartnell slid his way into two points for the team and his first game winner in overtime. Just a lucky bounce against a team with nothing to play for? Or, might it be something else? Good Kharma? Cosmic payback for the horrid year they had a season ago? Could the hockey gods be smiling on a team that had its share of adversity - losers of 6 straight - hung together, believed in each other and made a collective decision to compete every night - no matter how long the odds? However, I do know that since December 27th, the Orange and Black have won 12 games while losing only three. (Yes, two of those three losses have come to the hated Jersey Devils...but work with me here) This is a team that has had their two goalies win six games each during this span. Yup, Biron and Niittymaki have won the same number of games during this run. Get Simon Gagne back, out goes white-hot Joffrey Lupul. No problem. Each guy had faith in the the other guys in the room. Faith is one of those funny things. You can't taste, touch or smell it. You either have it or you don't. Merriam-Webster defines the noun as, "a firm belief in something for which there is no proof." In hockey, as in any sport, a team that believes it can win, no matter what the situation, is dangerous. The Flyers are on their way to becoming that team. They are finding ways to win instead of finding ways to lose. Throw the puck at the net, sure. Harts will be there to knock it in off his skate without a kicking motion, score the goal. Simple as that. And yet we all know it is nowhere near that easy or convenient. A team that believes in itself, its players and in its ability to prevail in adversity is a scary thing to play against. The Flyers are scary right now. 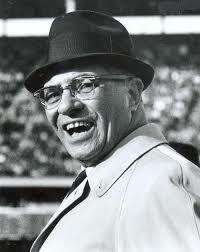 The other part of Mr. Lombardi's message is about discipline. Yeah....riiiiight. Five Flyers suspended since the beginning of the season. in the immortal words of child-star, Gary Coleman used to say, "Whatchoo talkin' 'bout Willis?" OK...so the Flyers haven't been choirboys. Neither have the Anaheim Ducks and they won Lord Stanley's hardware with a healthy mixture of grit, tenacity and marginally legal play. The point is, it appears as if the Flyers are learning to control their aggression and that they are taking fewer retaliatory penalties. Whether this is valid or not will be borne out through the sprint to the playoffs. One aspect of the game in which they are certainly showing discipline is on the man advantage. The Flyers powerplay hasn't been a force to be reckoned with since the days of the Legion and Rico at the point - 53 pp goals in 2006-'07, 80 in 2005-'06 and 60 in 2003-'04. As of last night, the Orange and Black have a league leading 61 powerplay goals in just 49 games. 61 powerplay goals in 49 games...in case you thought you didn't read it properly. In the last 15 games, the Flyers have 21 PP goals. To consistently make teams pay for taking penalties against you is a sure sign of discipline. It means you are never really out of any game - which goes back to the initial notion of faith and believing in your ability to win no matter the odds. I believe the Flyers have both faith in themselves and the right amount of discipline, where needed, to become winners. As with most things in life, the motivation of the individual is where the rubber meets the road. In 1975-76, a young man from Manitoba, named Reginald Joseph Leach, was asked the meaning of success. "The Riverton Rifle" had just won the equivalent of the Richard Trophy by scoring 61 goals, totalling 91 points and was the only non-goaltender to win the Conn Smythe Trophy as Playoff MVP in a losing cause against the Montreal Canadians in 1976. Reggie Leach replied, "Success is not the result of spontaneous combustion. You must set yourself on fire." 33 games left boys...Flame ON! Quite a change from just one season ago. Good luck to Philly and her Flyers. Excellent read as always SYF. Just because you play the worst team in the league doesn't always mean a win. Remember we spanked the Ducks last season. As much as I hate to root for a New York team myself I just can't root for cheaters. Go Eli and the Giants!! = )Great blog SYF, it has been a great year for the Flyguys so far.